When I started this over ten years ago, and I was told beadwork "wasn't period" in the medieval timeperiod. Well, as you will see from the sources I've proven that it is since and I don't hear that arguement anymore. I wanted to make sure others didn't either. That's why I created this site. If you see anything here that can help you in your studies, your documentation or your teaching, please take it, but please provide links and credits back to this site so then others can examine this field more in depth (and see them in full-color where possible). Are you an Apprentice or a Student to a Laurel? Want to discuss medieval beadworking with other SCA scholars? I'm pleased to announce that I believe I've found where the parchment squares at the V&A (one of them shown at left) originated from with the discovery of a textile fragment at a museum in Halberstadt, Germany, Now in COLOR. RESEARCH: Discovery about the `3th Century Germans beadwork squares at the V&A and thier origin. HELPFUL: My list of words you need to know in German for beadwork research. Very bad to search in, but VERY packed full of medieval beadwork if you know how, and where, to look. Features over 1,400,000 photos of art and art treasures objects in and around Germany. Not for the faint of heart and knowledge of German helpful. Need help with that German word from the above site? LEO will not only define in English it you can hear it spoken. They also do French. I love this site so much I want to make out with it. 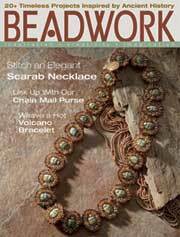 Over 7,500 links of interest to medievalists and a very nicely packed beadwork category. Research anything here. Search for those rare foreign language books here. it's where I shop for mine. Searches a dozen systems in the US and Europe. Don't fear, shipping direct from Europe is cheaper than domestic! "Sacred Embellishment: A Look at Medieval German Bead Art"
2 hours, limit 15, $5 class kit. 2 hours, limit 10, $5 class kit.